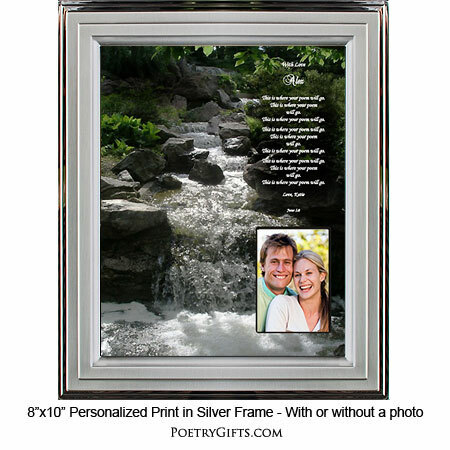 We can help you create personalized Poetry Gifts for the special people in your life. 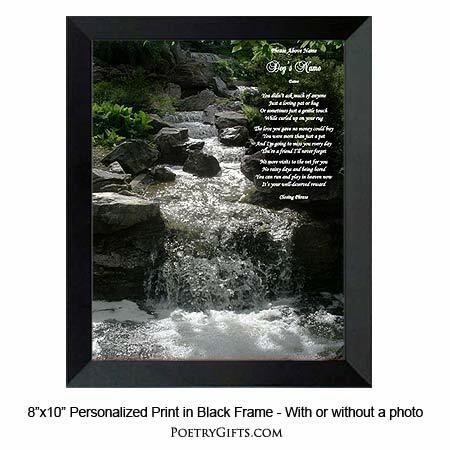 This inspirational beautiful waterfall design is the perfect background for your poem. Let us make your words come alive when we design your poem in this striking outdoor background. Maybe you want to inspire a friend to "go for it" or maybe you've been wanting to write a love poem to your husband or wife. Or just maybe you've been wanting to thank your mother or father for all they've done for you. There are so many reasons to give the special people in your life, the gift of your words. Imagine how your "special someone" and family members will feel when they know you took the time to write a poem just for them and had it personalized with their name(s) and a closing message from you. You can't put a price on a one-of-a-kind personalized gift that will mean so much! Want to make your Poetry Gift even more special...insert a favorite photo in the cut-out photo area. 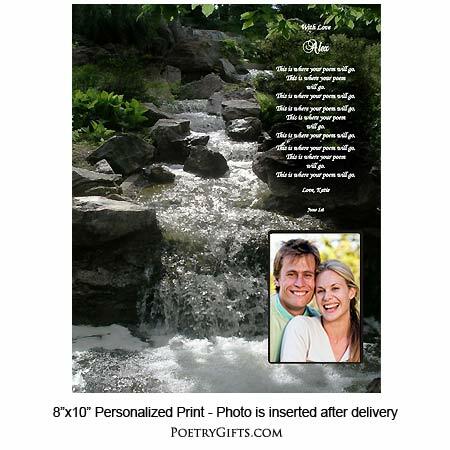 Your words and personalization + this beautiful waterfall design = unique gifts for your family and friends. 3. Closing Phrase and Your Name(s) (as seen after poem) - (Examples: God Bless You, Sandra; With Love Always, Mom & Dad; etc." 6. Please type in your poem (do not use all upper case lettering) - This is where you will type in the poem, verse or sincere thoughts you have written. A Poetry Gifts designer will take the lines of type and design it into the Poetry Gift above making sure that it looks its best. Please look at the above design in order to determine a suitable poem length. We suggest your poem is no longer than 16 lines with no more than 12 words in each line. There are no set guidelines; this is just a suggestion. If your poem is much longer than the length we are suggesting, the font/type will need to be made smaller to accommodate your entire poem. On the order form, please make sure to type your email address that you check often and phone number in case the designer needs to reach you with any questions. Unless you have permission from the author or poet, please only submit non-copyrighted materials. And there you have it...a meaningful personalized gift for a family member or friend to be read and be enjoyed for years to come. Very pleased to have found this site, exactly what I was looking for. Definitely not disappointed in the least. Quick service, received fast.